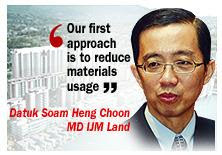 Property developer IJM Land is putting about 5 per cent of the construction costs of the Penang waterfront project into green-related technologies. a) Owners of buildings awarded the Green Building Index (“GBI”) certificate be given tax exemption equivalent to 100% of the additional capital expenditure incurred to obtain the GBI certificate. The incentive is applicable for new buildings and upgrading of existing buildings. The incentive is given only for the first GBI certificate issued in respect of the building. The proposal is effective for buildings awarded with GBI certificates from 24 October 2009 until 31 December 2014.
b)Buyers of buildings and residential properties awarded GBI certificates bought from real property developers are eligible for stamp duty exemption on instruments on transfer of ownership of such buildings. The amount of stamp duty exemption is on the additional cost incurred to obtain the GBI certificate. The incentive is given only once to the first owner of the building. The proposal is effective for sale and purchase agreements executed from 24 October 2009 until 31 December 2014. The article only mentioned about Green Technolog, but never mentioned about Green Building Index. Which means, the project may not be certified/recognised. Anyone can learn and know how to ride a motorcycle, but not all of them have legal license. Another article in Oct 2008 from IJM's own website originally said that the project was going for LEED (a US Green Building standard), and seems like the plan has been aborted.